Michael Patrick Nicholson, Michael Godere and Chelsea Lopez star in director Xander Robin's strong feature debut. 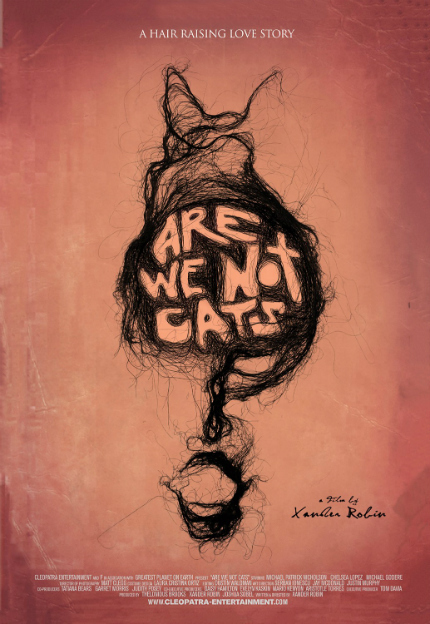 Adapted from a short film of the same name, Are We Not Cats is a surprising and bold piece of filmmaking by director Xander Robin. It tells the story of a young man, Eliezer (Michael Patrick Nicholson), who is swiftly going nowhere, especially when he loses his job and girlfriend -- and his happy Russian immigrant parents decide to sell everything and move to Arizona. He is gifted his father's truck, in which he must now live, and promptly gets a gig delivering a big engine to upstate New York. While there, he's invited by hothead, druggie, and abusive dude Kyle (Michael Godere, who really sells it) to a local underground music night and meets Anya (the terrific Chelsea Lopez). Eliezer quickly becomes enamored of Anya, who has some personal issues herself. We see Kyle hit her at the club and she laughs it off. Of course, that's not okay, nor does the film state as such. However, Eliezer is a meek individual. And so, instead of retaliating against the aggressive Kyle -- who'd likely beat the crap out of Eliezer, too -- our protagonist gets a job at the lumberyard where Anya works. Of course, the two eventually become romantically entangled, but it's not quite a smooth transition. Eliezer's new boss is an alcoholic. Kyle stabs Eliezer's truck tire, stupidly rendering him incapable of leaving Anya, even though she's upset that Kyle goes on a trip. This part is a little too convenient for our characters, but a bumpy ride does ensue. Eliezer and Anya sleep together, and we see her extreme penchant for eating hair absolutely devour Eliezer's flowing mane. Now he is as bald as she is, as Anya has gone through her own head of hair in her grotesque obsession. Eliezer is bothered and upset by this, but more confused than anything. He tries to leave, but there's that pesky flat tire. And the small matter of a comatose Anya, who's now dying from the enormous hair rock in her intestines. The FX here are practical, disgusting, and very well done. Eliezer gets on the phone with emergency services, and since they can't reach the couple in a good amount of time, he decides to engage in impromptu surgery. It's... revolting. Surprisingly, there's a few laughs in addition to the horror here, and everything ends up okay in the end. As farfetched as that is, the denouement is touching. In all, if you like very weird films and elements of the grotesque -- and can stomach that -- Are We Not Cats is a hair-pulling winner. Review originally published in slightly different form during the Morbido Film Festival in November 2016. The film opens in select U.S. theaters via Cleopatra Entertainment on Friday, February 23.